We’d love your help. Let us know what’s wrong with this preview of Stone Bridges by Carla Neggers. New York Times bestselling author Carla Neggers has captivated readers with Knights Bridge--a scenic New England town where families and friends experience joy and face challenges together. With its world of inns, old houses, wonderful, quirky characters, romance and adventure, it's a town you won't want to leave. Adrienne Portale has never settled in one place for long, New York Times bestselling author Carla Neggers has captivated readers with Knights Bridge--a scenic New England town where families and friends experience joy and face challenges together. With its world of inns, old houses, wonderful, quirky characters, romance and adventure, it's a town you won't want to leave. Adrienne Portale has never settled in one place for long, but takes a job as innkeeper in tiny Knights Bridge, Massachusetts, to spend some time getting to know the father she only recently found. When three small boys get lost in the wilderness that borders the inn, Adam Sloan leads the search. His family ties to the town go back generations. Adrienne sees the bond that people in a small town have as they band together to find the missing children. To ask other readers questions about Stone Bridges, please sign up. Carla Neggers takes readers back to her iconic small New England town of Knight’s Bridge and continues the story of Adrienne Portale who costarred in a previous novel when she learned she was the illegitimate daughter of a diplomat and came to Knight’s Bridge to confront him. Tired of wandering (for now) and deciding she likes this small hamlet she takes a position as an innkeeper (temporarily) but finds herself unbelievably adapt at her job and more than just a little attracted to the local stonemason Adam Sloan –– Adam who is as steadfast as Adrienne is impulsive is 4 of 6 in the large Sloan brood, a vet who wanted nothing more than to come home from war and never leave. She also takes her good old time with the romance, takes the simmering route over the sizzling one and it works really well with her unlikely, odds attract couple that she convincingly convinces readers are the perfect pair. If you’re a fan of small towns inhabited by caring but extremely nosey salt of the earth folks, incredible scenery, a low-key romance and an unforgettable story look no farther. Story reads well alone but for series continuity books should be read in order. Adrienne Portale has settled into Knights bridge, NH. She originally came to the town to connect with her Father she just learned about. She is working as an Innkeeper. This is part of the Swift River Valley series but could be read as a stand alone. It is a romance in a small town setting. It is a good addition to the series. The romance is slow to develop and along the way you get to know the people and experience life in a small town. Thank you to net galley for an advanced readers copy. 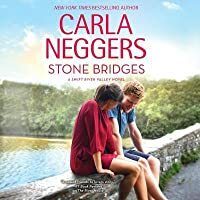 Stone Bridges (Swift River Valley #9) by Carla Neggers ...Fantastic book by Carla Neggers..I haven't read all the books in this series but I plan to go back and read them.. Thanks to the publisher and #NetGalley for turning me on to this book. This is Adam and Adrienne's story (he is a stone mason and also part of his family business...she is a wine blogger who is now an innkeeper). This story is also about the small town a lot like Knights Bridge and I enjoyed all the people and intrigue of a s Stone Bridges (Swift River Valley #9) by Carla Neggers ...Fantastic book by Carla Neggers..I haven't read all the books in this series but I plan to go back and read them.. Thanks to the publisher and #NetGalley for turning me on to this book. This is Adam and Adrienne's story (he is a stone mason and also part of his family business...she is a wine blogger who is now an innkeeper). This story is also about the small town a lot like Knights Bridge and I enjoyed all the people and intrigue of a small town.. The journey and how Adam and Adrienne come together is filled with laughs, some drama, lots of wonderful family and friendships, and of course a very HEA. I can't wait to find out who falls in love next. Another in the Swift River Valley series, in which Adrienne Portale moves to town to become an innkeeper while getting to know the father she never knew until she was an adult. Living there after returning home from his military service is stonemason Adam Sloan, another one of the handsome Sloan brothers. Adrienne knows a buff guy when she sees one, but her plan to be here only 6 months--given her pattern of taking short-term jobs all over the globe--means she should not get involved with him. Af Another in the Swift River Valley series, in which Adrienne Portale moves to town to become an innkeeper while getting to know the father she never knew until she was an adult. Living there after returning home from his military service is stonemason Adam Sloan, another one of the handsome Sloan brothers. Adrienne knows a buff guy when she sees one, but her plan to be here only 6 months--given her pattern of taking short-term jobs all over the globe--means she should not get involved with him. After all, she's not staying and he's not going anywhere. I gave a high rating to this book because I have read and enjoyed the Swift River Valley series very much. I spent quite a bit of time at Quabbin and I’m imagining where all this takes place. I know it’s fictional but it’s fun to wonder/imagine just the same. What it must have been like to have your home and land taken for the use of making Quabbin! Enjoy reading the series if you haven’t started it you should! Excellent addition to the Swift River Valley series! This is a story with plenty of emotion, chemistry, friends and family relations, love. Adrienne and Adam are strong characters with an obvious attraction to each other. Both are weary of that connection and getting involved. Reading previous books in the series isn’t necessary (the author does a good job of explaining who’s who), but it’s a series worth reading! I love to go back to Knight's Bridge. This series is wonderful. This story revolves around Adrienne Portale and Adam Sloan. She is the new innkeeper at Carriage Hill and Adam is one of the six Sloan siblings. The met in the last book, but now the real attraction is there. Follow their love journey on whatever path they take. I really connected with the characters and the story was good too. The two main characters danced around each other a lot and then got together very abruptly but it worked. I'm looking forward to reading about the other Sloan brothers and catching up on the lives of the other Swift River Valley residents. Stone Bridges is a lovely, slow paced read that allows you to absorb all the events and thoughts that happen when two unlikely people are falling in love. There are a lot of characters to place but Ms. Neggers gives you a list of whom they are and where they fit in the series. It’s a nice touch. Disappointing novel which had too much repetition about whether they should kiss or not and heavens if they did kiss. Having a mason and and innkeeper as the main characters was a good idea, but include a little more about these trades and less about the attraction. While the book was readable, it was a chore to get to the end. I am delighted to say that I have just celebrated a wonderful wedding among friends I have made through the many books of Carla Neggars. I wonder who is next. Guess I’ll have to give the author a little time to conjure up another HEA tale. Get to work Carla. I can not wait to find out whose next! I have read all the books in this series and other related ones and this one was the most boring I have ever read. A really good and enjoyable experience.I laughed and laughed until there were tears running down my face.This was a romantic story I won't soon forget. Outstanding. The characters are such loving individuals, and actually care about each other. I enjoyed this book. Adrienne and Adam were both likeable characters. Not much drama, just an enjoyable addition to the series. A romantic story of an innkeeper and a stone Mason in charming New England. Very enjoyable! This review has been hidden because it contains spoilers. To view it, click here. I love the Swift River Series and looked forward to this installment. And, I mostly loved it. However, I found the ending too fast and not as believable as some of the other books in this series. I thoroughly enjoyed this book. The story was very good and interesting to me. I highly recommend to all readers. Loved it. I love this series and this one might be the best so far. MS Neggers has a great way of pulling you in so you can't put it down. Between having to work and being sick it took me a long time to finish another wonderful book in this series. Can't wait for Eric and Chris's stories. I love this series. It's like a letter from home! I'm hoping for more stories! Please gives us more, please!! Carla Neggers is the New York Times bestselling author of the Sharpe & Donovan series featuring Boston-based FBI agents Emma Sharpe and Colin Donovan, and the popular Swift River Valley series set in the small, fictional New England town of Knights Bridge. With many bestsellers to her credit, Carla loves to write now as much as she did when she climbed a tree at age eleven with a pad and pen a Carla Neggers is the New York Times bestselling author of the Sharpe & Donovan series featuring Boston-based FBI agents Emma Sharpe and Colin Donovan, and the popular Swift River Valley series set in the small, fictional New England town of Knights Bridge. With many bestsellers to her credit, Carla loves to write now as much as she did when she climbed a tree at age eleven with a pad and pen and spun stories perched on her favorite branch. A native New Englander, Carla and her husband divide their time between their hilltop home in Vermont, a sofa bed at their kids' places in Boston and various inns, hotels and hideaways on their travels, frequently to Ireland. Find out more and sign up for Carla's newsletter at CarlaNeggers.com.